In the Ozark School District in Ozark, Mo., the Student 360 parent-student web portal provides parents, students and school staff mobile access to student data. Tyler Technologies provides the portal and touch-enabled Student 360 app. In the Ozark School District in Ozark, Mo., the Student 360 parent-student web portal provides parents, students and school staff mobile access to student data. The touch-enabled Student 360 app works with tablets and smart phones so student data can be accessed from virtually anywhere via Internet-connected devices. The portal works with the manufacturer’s Tyler SIS student information system. With the app, schools can deliver a comprehensive student information system solution. It enables more options for accessing student data while improving overall communication between parents, staff and students. The portal complements Tyler SIS, a suite that offers core school district functions, including attendance, grade book, scheduling, enrollment, transcripts, GPAs and discipline. Current Tyler SIS clients will receive the Student 360 platform without additional license fees through the company’s evergreen perpetual licensing program. The program provides regular and significant software enhancements without an additional relicensing fee to help ensure that all systems are on the latest technology. 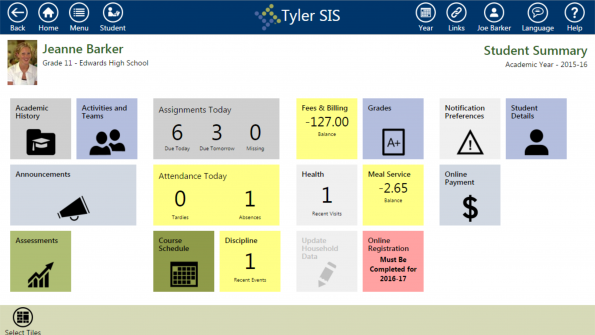 The district went live with Student 360 in March 2016, after implementing the Tyler SIS in 2006. The Student 360 app was built with end-users in mind and leverages current technology, including mobile security measures. The platform’s agnostic, touch-enabled user interface is as easy to use on laptops, tablets and mobile phones as it is on desktops. Go here for information on Tyler Technologies.